The story of three estranged siblings who congregate for their mother’s funeral following the discovery of a skeleton in the garden of their old home. They find old 16mm home movies, and upon watching them discover secrets about their family, their parents, the skeleton, and the reasons behind their estrangement. 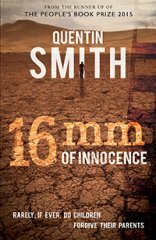 In addition to being a novelist, medical doctor and practising anaesthetist, Quentin Smith is a graduate of London School of Journalism, Curtis Brown Creative and the former editor of Today’s Anaesthetist. Well done cousin. We are all very proud of you! Excellent read. can't wait for more. This is a terrific story of family secrets, woven into the history of Namibia. It is well written and keeps you engaged from the first page until the last. A great achievement! The plot - The Characters - The unravelling of a chillingly suspenseful story- is pure entertainment coupled with the thrill of discovery and historic context all wrapped up together - a great read!! A compelling book from beginning to end. Well done Quentin! I really enjoyed this book. It very vividly brought to life the location in which the story is set, and the dilemmas faced by the characters. A powerful read. I would highly recommend this book. It's interesting and from start to finish and a compelling read. As ever from this author, a compelling read. Awesome book! Gripping, couldn't stop until the end! A truly accomplished effort - great book for a rainy day.